What is a Certified Public Tax Accountant? 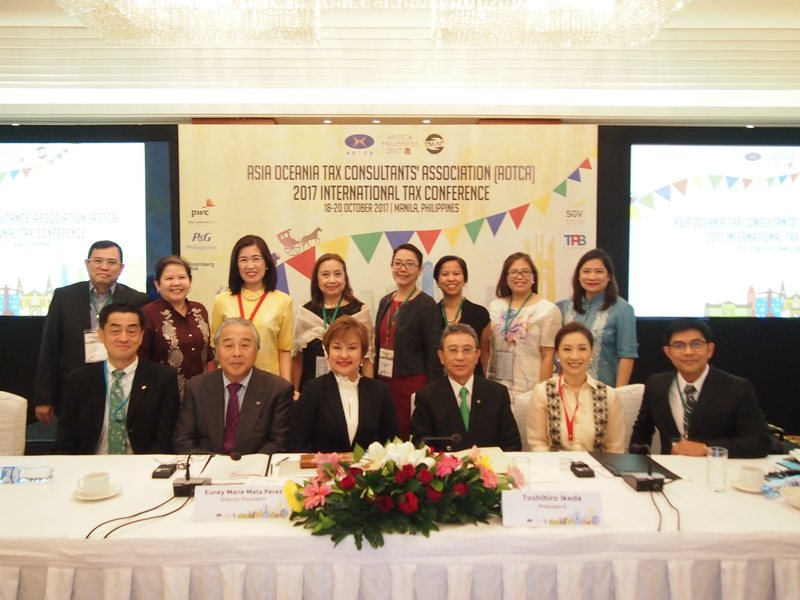 The Asia Oceania Tax Consultants’ Association (AOTCA, President: Toshihiro Ikeda) convened its annual meetings and International Tax Conference at the Makati Shangri-La Manila, the Philippines from 18-20 October 2017. Hosted by the Tax Management Association of the Philippines (TMAP, President: Ms. Maria Lourdes P. Lim), the Manila meetings were attended by about 300 overseas and local participants including some 30 Japanese delegates. The General Meeting held in the morning of 19 October deliberated various important agenda including the business plan and budget of Fiscal Year 2018. The meeting confirmed that, based on the AOTCA’s mid-term visions “to become a tax professional organization which is widely recognized as an influential body”, AOTCA will continue to promote collaboration with STEP and CFE, to strengthen its international relationships with global bodies such as SGATAR, OECD and West African Union of Tax Institute (WAUTI), as well as to promote further communication between member bodies. Following the General Meeting, the International Tax Conference was held on 19 and 20 October, where many speakers made presentation with various topics such as Transfer Pricing Post-BEPS, Tax Reform, Tax and Technology, Best Practice on Tax Administration. In the session “Country Update -- Tax Reform”, Mr. Takeshi Ogura, deputy chairman of International Relations Department, representing JFCPTAA explained Tax Reform in SMEs in Japan. The detailed program is shown below. AOTCA will hold its annual meetings in Ulaanbaatar, Mongolia in 2018. 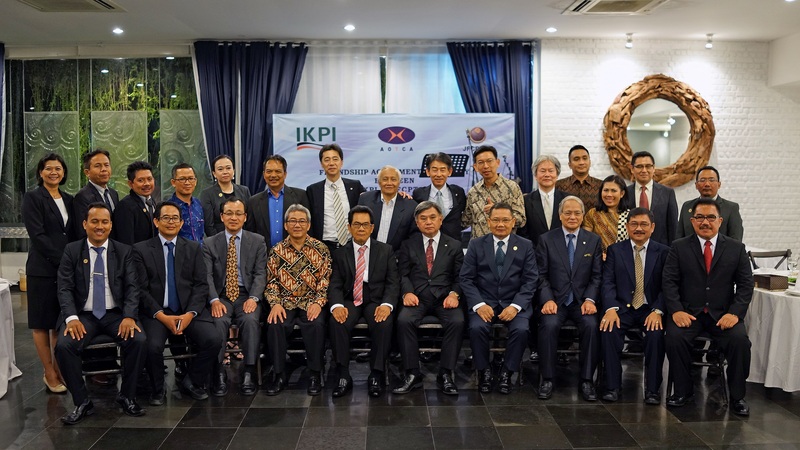 JFCPTAA President Kozu and his officers visited Indonesia from April 12 through 16, 2017 to conclude the Friendship Agreement with the Indonesian Tax Consultants Association (IKPI). In addition to conclusion of the agreement, this visit to Indonesia was aimed to hold a conference on tax professions in both countries. Presently the tax professional system in Indonesia as well as IKPI is established under the ordinance of the Finance Minister. IKPI does expect that the tax profession will be legally established in Indonesia near future and that the association itself will be formed under the law. On April 13, the Japanese delegates headed by President Kozu made a courtesy visit to the Directorate General of Taxes of Indonesia (DGT) and talked with Secretary of Directorate General Arfan and other officers of DGT. After that visit the delegates moved to the IKPI Building, where “the conference on tax professionals in Indonesia and Japan” was held. Jointly organized by JFCPTAA, IKPI and DGT, this conference consisted of several sessions. President Kozu explained the historical development of Japanese tax professional (zeirishi) system, Chairman of International Relations Department Hasebe explained the overview of the zeirishi system and Prof. Fushimi outlined the relationship between zeirishi and tax administration in Japan. From IKPI and DGT both sessions on tax profession in Indonesia were performed from the viewpoints of tax professional and tax officer respectively. At the last session, namely question and answer session, various questions on zeirishi were raised. This conference was attended by about 100 officers or members of IKPI. On the next day, April 14, JFCPTAA and IKPI cerebrated a ceremony for concluding the Friendship Agreement, attended by President Kozu and other 7 officers of JFCPTAA, 4 officers of GDT including Secretary of Directorate General Arfan and President Soebakir and other 15 officers of IKPI. Determined to strengthen the relationships between both organizations focusing on the legal establishment of tax profession in Indonesia, President Kozu and President Soebakir signed the agreement and they exchanged the signed books. JFCPTAA has concluded the friendship agreement with 15 foreign counterparts including IKPI.